Jersey City was the initial destination for a large group of immigrants who came to this country via Ellis Island, which was in operation nearby from 1892 until 1954. Today, Jersey City is a reflection of the many cultures that call the city home. 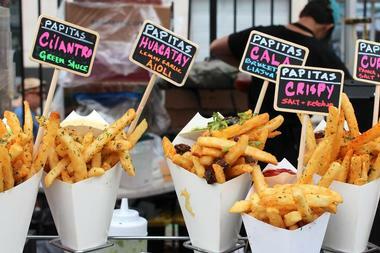 The city's multicultural influences can be sampled by its varied and storied culinary offerings. There is significant amount of green space, with Liberty State Park covering 1,212 acres. Here are the best things to do in Jersey City, NJ. The Empty Sky Memorial is dedicated to the 749 innocents from New Jersey who were killed on September 11th, 2001 at the Pentagon, the World Trade Center, and in Shanksville, PA. The memorial was dedicated on September 10, 2011, attracting more than 3,000 people. At the memorial, visitors will find two walls of the same measurement transecting a sloped mound anchored by a granite path directed toward Ground Zero. 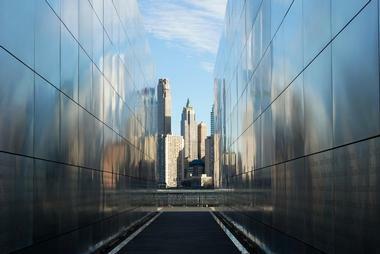 The 749 victims' names face one another on the twin brushed stainless steel walls. The walls direct visitors to the place where the World Trade Center towers stood. 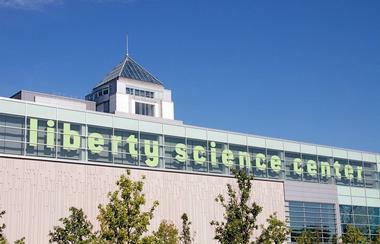 Plan a fun family afternoon at the Liberty Science Center where kids can learn about science through interactive exhibits which change through the seasons. One of the exhibits has included "Honey Bees: The Home is Where the Hive Is," the colony has been moved largely indoors to encourage guests to see workers converting nectar into honey and storing it in the honeycomb cells, bees traveling in and out of the hive, larvae growing and maturing, and the queen laying eggs. At some point, guests may even observe the harvesting of honey by beekeepers. At LSC's IMAX DOME theatre, there are several films playing. Guests will enjoy the domed screen, which is 88 feet in diameter, in a 400-seat theater. At Science Camp at LSC, 2016, sessions are offered throughout the summer to four classes of students. Visiting Liberty Island is truly a rewarding endeavor, but guests wishing to enter the pedestal, the crown, or the museum must secure reservations. A grounds-only ticket is the most widely available ticket, and it provides guests with access to the island. Pedestal tickets, which are limited, let visitors access the museum, the Fort Wood level, and the inside the pedestal. Only a certain number of pedestal tickets are available every morning at ticket offices. Crown tickets let guests access the museum, pedestal, crown, and the Fort Wood level. Advanced reservations for these limited tickets are required. Tickets from Statue Cruises to Liberty Island include access to the Immigration Museum and Ellis Island. Some 2,000 feet from the Statue of Liberty on the New York Harbor sits Liberty State Park, which has played a central role in developing New Jersey's metro region and, indeed, the country itself. In the nineteenth and early twentieth centuries, the area that now comprises Liberty State Park was a premier industrial waterfront area replete with a passenger and freight transportation network, and the Central Railroad of New Jersey (CRRNJ) Terminal was the focus of this transportation network. Indeed, the CRRNJ, coupled with the Statue of Liberty and Ellis Island, witnessed the vast European immigration into the country. After seeing the Statue of Liberty and getting through processing at Ellis Island, immigrants departed from trains at the CRRNJ Terminal, trains that took them to new venues throughout the country. Liberty State Park opened on June 14, 1976 as a 1,122-acre park. The CRRNJ Terminal unites with Ellis Island and the Statue of Liberty to preserve the country's landmark trilogy. 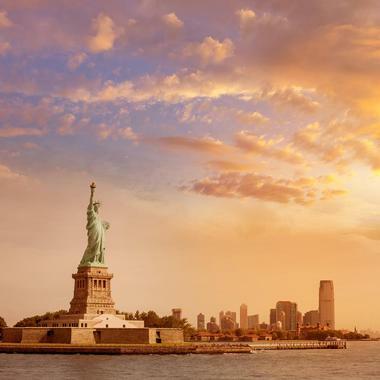 Statue Cruises has several tour options for boats to the Statue of Liberty and Ellis Island. All tickets include the Ellis Island Immigration Museum, Statue of Liberty grounds, and audio tour. A Crown Reserve Ticket includes access to the crown and pedestal of the Statue of Liberty National Monument. These tickets are limited. With a Pedestal Reserve Ticket, visitors can access the statue's pedestal. These tickets are limited. With a Reserve Ticket, guests receive access to grounds of the Statue of Liberty National Monument. For the Hard Hat Tour & JR Exhibit, a guest ticket includes a 90-minute tour of Ellis Island's South Side, where guests will see "Unframed - Ellis Island," an exhibit by the French artist JR. Statue Cruises ferries depart from Battery Park in New York and Liberty State Park in New Jersey. 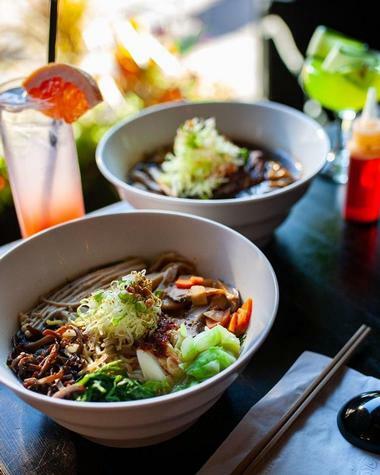 From its Jersey City headquarters, Jersey Girls Food Tours has done the hard work for its guests by finding the best eating establishments to sample. Learned and enthusiastic tour guides take guests on walking food tours, highlighting great cuisine with the goal of providing tourists and locals with incredible eating adventures. Tours range from formal meals to informal sample bites and generally take guests to four to six establishments. The walking is easy, and the tastes are unforgettable. Jersey Girls Food Tours is also available for private events, for groups like wedding parties, family reunions, office or corporate outings, team building, holiday parties, birthday celebrations, and girls' or guys' night out. Artist and Maker Market (AMM) is an outdoor marketplace that features premium hand-crafted goods and locally created fine art. The group connects artists with the metro NYC community. AMM was founded in 2015 and encourages artists in the areas of crafts, art, and design. AMM supports handmade goods versus mass-marketed items and seeks to provide a thriving place for these items to be sold. AMM's spring and summer season is operated in conjunction with the Groove on Groove weekly live music series. Situated in a Jersey City historic district, Van Vorst Park is an elegant 1.8-acre downtown space. Cornelius Van Vorst originally donated the area in 1848, and horticulturist Peter Henderson landscaped the park in 1851. Flanked by a plethora of brownstones from the nineteenth-century, the park was dramatically restored in 1999. The community maintains its gorgeous gardens. Van Vorst Park features two playgrounds for older children and toddlers, dog runs, benches, paved walkways, a plaza, community gardens, a fountain, and a gazebo, plus open green space. Cultural events include a farmers' market, Shakespeare in the Park, films in Van Vorst, and a flea market. Located at the intersection of Montgomery Street and Jersey Avenue across from the Jersey City Free Public Library and a few blocks southeast of the Grove Street PATH Station. Since New York City is surrounded by water, a great way appreciate the size and beauty of Manhattan and the surrounding boroughs is to explore them via water. Sea the City's guided jet ski tours take guests to the Statue of Liberty, Ellis Island, Brooklyn Bridge, Wall Street, Governors Island, One World Trade Center/Freedom Tower, Brooklyn Bridge Park, and more. Tours are intended for novices as well as experienced riders. Guides stop often to answer questions and allow time for picture taking. 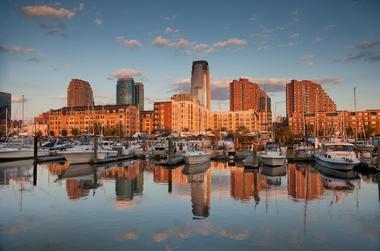 Sea the City offers New York City Jet Ski tours from its Jersey City location. 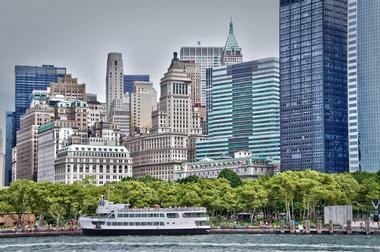 The marina is a 10-minute ferry boat ride from the World Financial Center. Sail NYC provides private boat charters for an active sail in stunning New York Harbor. Its yachts are privately owned, and the captain is the owner. 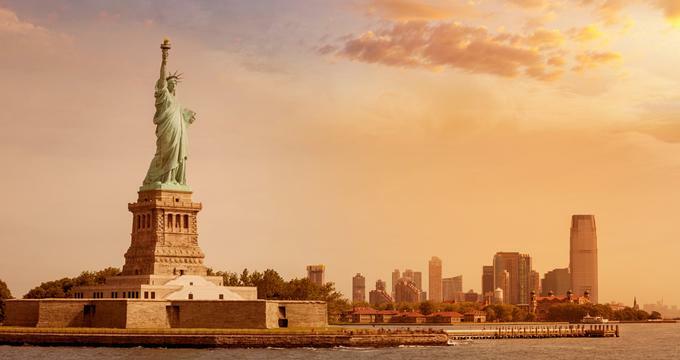 Guests can simply enjoy the sail or become a member of the crew and take the helm or hoist the sails as passengers get a glimpse of the Manhattan skyline or the Statue of Liberty. The skippered boat charter includes a USCG-licensed captain for a one-of-a-kind adventure in one of the world's most exciting places. The Historic Jersey City & Harsimus Cemetery is one of the first garden style landscape cemeteries ever established, a concept that revolutionized cemeteries across the nation. A contingent of leading New York City and Jersey City leaders founded the cemetery, and it is home to many of the city's founders and soldiers from WWII, WWI, the Spanish-American War, the War of 1812, and the Revolutionary and Civil Wars. Prior to 1829 when it became a cemetery, it already had historical significance: there is an ammunition bunker from the War of 1812 that still stands, and the land dates to the 1700's, when it served as the site of several Revolutionary War battles. After exhaustive renovations and reconstruction, Grundy Park was re-opened in July of 2008. It shoots out into the Hudson River, offering excellent views of Liberty State Park, Lower Manhattan, and the Jersey City waterfront. Named for J. Owen Grundy, the local preservationist, the park often hosts the City's Tapestry of Nations Festivals and other performances, including Jersey City's Division of Cultural Affairs' Jazz for Lunch Concert Series. The Hudson-Bergen Light Rail and PATH trains take visitors right to the action. This waterfront pier park features game tables, the waterfront promenade, seating, historic lighting, entertainment pavilion, and shady areas. Zesty Basil offers private vegetarian cooking classes at their kitchen in Jersey City or in its clients' kitchens, provided they live a workable distance from Manhattan or Jersey City. Classes are scheduled at the client's convenience and are available every day of the week from 9 am - 9 pm. 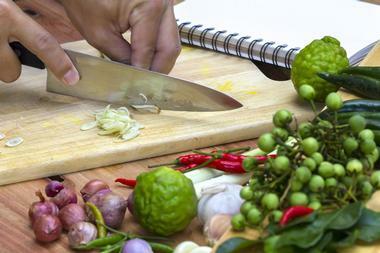 For parties and cooking classes in clients' kitchens, menus can be created for that occasion. One sample menu is titled Sweet and Savory Baking. This features sweet or savory scones, a fresh fruit tart, cakey chocolate chip cookies, and sweet and spicy roasted pecans. Another menu features authentic southern Indian cooking, which includes dosa, a semolina/rice flour crepe with traditional spicy potato filling; idli, which are steamed semolina/rice flour pancakes; uttapam, pan-fried flat semolina pancakes; sambhar, a lentil and vegetable stew; and tomato chutney. Jersey City Theater Center's mission is to present progressive and innovative visual and performing arts, plus educational art programs that preserve the rich history of Jersey City and highlight its diverse identity. The theater intends to bring the community closer together and enhance its quality of life. JCTC programing includes music, theater, film, dance, and multi-media. As the community has welcomed JCTC with their encouragement and patronage, the organization has discovered how significant a thriving arts community can be for a city, and more importantly, that the arts need to be accessible to all people, both in Jersey City and throughout the surrounding region. JCTC will continue to create programs that embrace Jersey City's diverse population and rich history as well as develop thought-provoking productions that spark conversations and help bond the community together. As it aims to inspire creativity and enhance the quality of life in the region, JCTC will focus on providing arts to all, thereby making a genuine and lasting vital impact in the area. JCTC Arts-4-All, JCTC-KIDS, & JCTC ArtLab are just some of the new programs that embody the philosophy that art is for all members of the community. Friends of the Loew's (FOL) advocates for the Loew's Jersey Theatre to be used as a not-for-profit entertainment and arts center to enhance the role that performing arts play in the lives of all those who live in Hudson County. The landmark theatre will feature R&B concerts, rock concerts, swing and jazz concerts, country and folk concerts, independent and classic film, multi-cultural programs, children's programs, and touring musicals and dramatic plays. Loew's will also be a venue for weddings, other social occasions, and business events. Located on the Hudson River across from the lower part of Manhattan, Liberty Landing Marina offers 520 slips, a facility for fueling 24 hours a day, transient dockage, complete maintenance, and a marine store. Because of its location in Liberty State Park, boaters have access to a ferry to Manhattan, two restaurants, the Liberty Science Center, and Statue of Liberty tours. Liberty Landing Marina boasts the highest standards for services and amenities. All boaters will enjoy all the conveniences of a full-service marina. 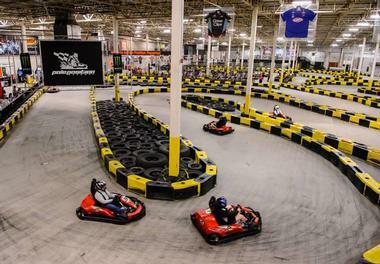 Pole Position Raceway Jersey City offers several options for go kart racing. One popular racing option is called Arrive & Drive, which allows individuals or small groups to race. These standard races run about 10 minutes, and drivers are separated into two categories. Adult karts are for those who are 58 inches or taller; junior karts are for those who are at least 48 inches tall and can drive safely. Group events and party packages provide reserved time slots for private racing. These packages are available in two, three, and four-race formats and include specialty items. Larger groups are also welcome. 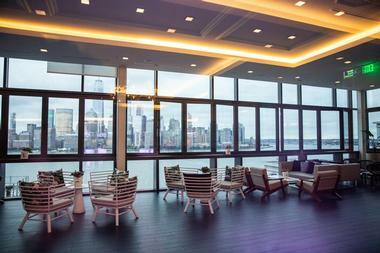 The Roof Top is a multi-level restaurant within Jersey City's Exchange Place, offering stunning views of the Manhattan skyline and landmarks such as the Statue of Liberty and Staten Island from its indoor and outdoor dining and lounge spaces. 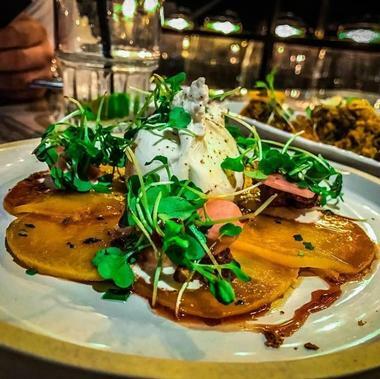 The restaurant, which is helmed by executive chef Gilberto Feliciano, offers year-round ambiance with a retractable glass roof and walls, serving up brunch, lunch, happy hour, dinner, and late-night service throughout the week. 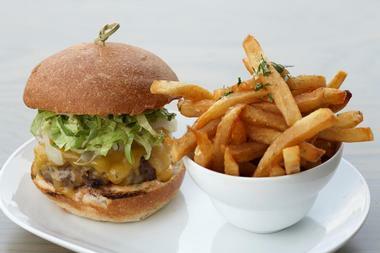 Shareable plates include charcuterie boards and flatbreads, while entrees range from clever burgers and sandwiches to internationally-influenced fare such as poke bowls and creative tacos. 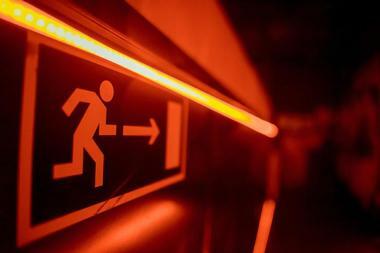 In addition to a carefully-selected menu of draft beer, fine wine, and craft cocktails, the restaurant offers bottle service on weekends, when its rooftop space turns into a nightlife hotspot with performances by top DJs. Once known as the C.A.S.E. Museum of Russian Art in Exile, this Jersey City institution is now called The Museum of Russian Art. The museum was founded in 1980 and has been instrumental in introducing American audiences to Russian art. Its main collection comes largely from the private collection of Alexander Glezer. In the 1980s and early 1990s, artists first exhibiting outside Russia at the museum included Alexander Kharitonov, Skate's 5000 notables, Alexander Kharitonov, Erik Bulatov, Evgeny Kropivnitsky, Dmitry Krasnopevtsev, Vladimir Nemukhin, Ernst Neizvestny, and Lidia Masterkova. Since its inception, the museum has fostered Russian community and culture in the tri-state region with events, lectures and exhibitions.